Derby's waste - a rubbish blog ! 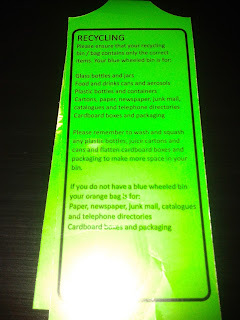 : A game of tag thats tag the recycling bin! A game of tag thats tag the recycling bin! 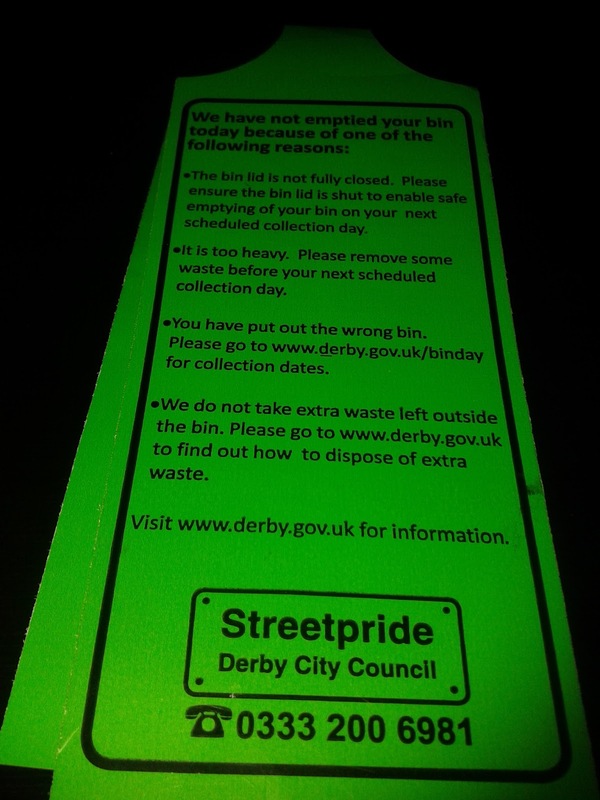 When it comes to waste disposal in Derby UK there can be nothing worse than going out to fetch your bin in only to find the green tag of doom attached to the lid! This is the tag that the council binmen attach to your bin if you have done something wrong - you may have overfilled it or you may have made it to heavy or you may have put things in you shouldn't. Don't expect the bin man to mark what the issue is - you are expected to guess what the problem is. My blog has highlighted media coverage on the subject where kerbside collections were removed in areas such as Mackworth, Arboretum and Normanton wards of the city. 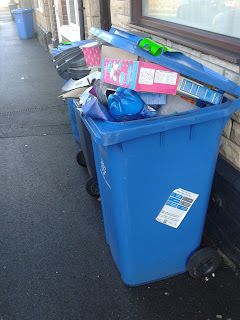 The justification was that bins were contaminated leading to rejection of loads by Biffa the councils recycling provider. When I exposed that loads were not being rejected shortly afterwards Biffa conveniently started rejecting material. Back in September 2014 my FOI request number 6346 showed that the contamination rate for the city was less than 6% at 5.8% and is shown below. ANSWER: None, rejects are taken out during the sorting process. The average percentage of rejected material from the start of the new blue bin collection system on June 4th 2013 to 31st March 2014 was 5.8% "
NOW REMEMBER THAT PERCENTAGE - 5.8% CONTAMINATION FOR LATER ! Where blue bin kerbside recycling was removed the replacement service - a restricted set of bring sites just became prime hot spots for fly tipping as shown below. 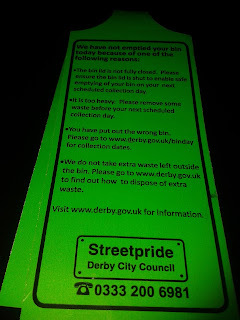 In recent weeks once again the council bin men in the Normanton ward of the city have been tagging bins in the streets. Some for lids being left up - where people try and recycle to much ! 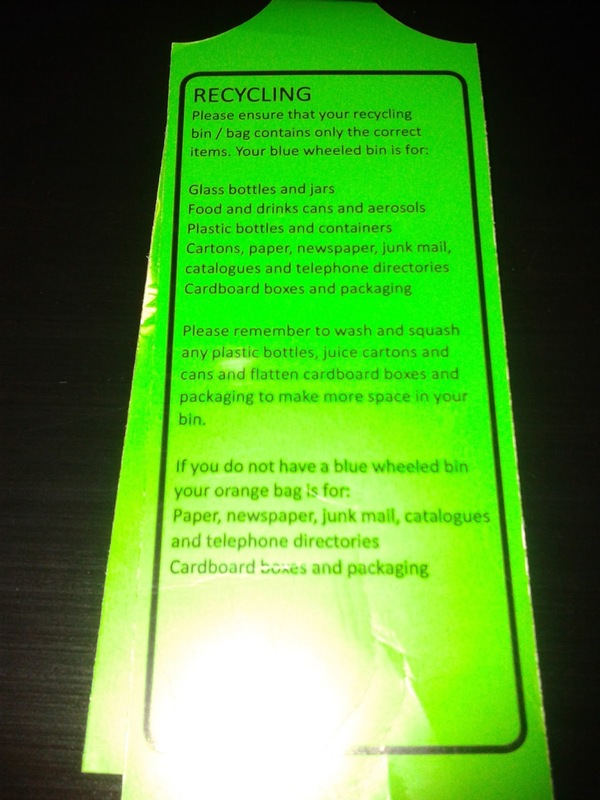 Others for questionable amounts of incorrect materials in the bins - or contamination to use the councils words. What the council misses is when tagging the bins they put that bin into limbo. 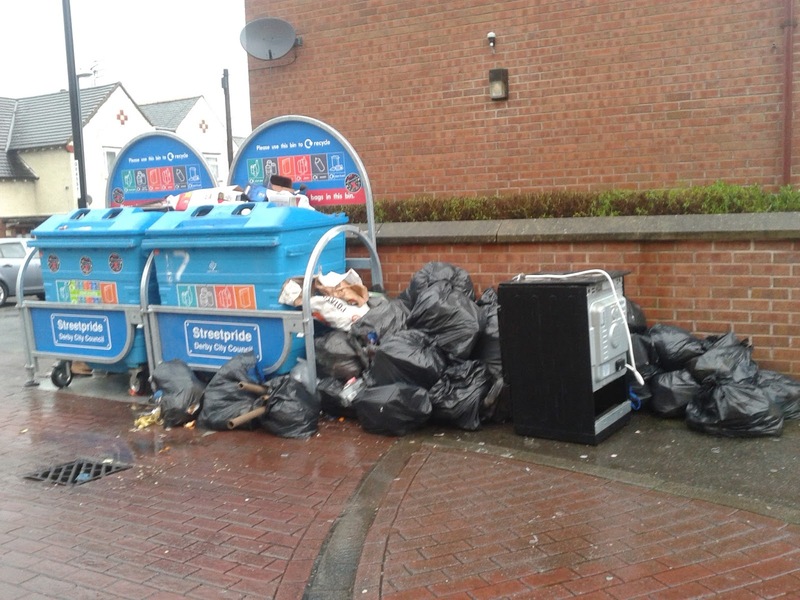 The resident doesn't not know what they have done wrong because the council does not identify the actual issue but the council also will not empty the bin until the issue is addressed. What happens is we end up blighting communities with bins in limbo where the residents don't sort the issue and the council doesn't act. Is that really the way forward to improve recycling in the city - which has crashed to around 33%? The council cabinet member when challenged on the extended tagging of bins in Normanton said that officers would look into it and empty those tagged in error but that they needed to maintain their stance on quality of material collected - siting recent load rejection by its contractor Biffa. I have not seen any bins being reviewed in this way. So the council have removed kerbside blue bin collections from many streets in a number of communities to help reduce recycling contamination. Lets just remember that contamination rate for 2013/14 - 5.8% so what is it now ? remove the poor recyclers and surely that rate improves further. "Over the last 3 reporting quarters the average contamination was 16 per cent. " CLEARLY THE COUNCIL DOES NOT HAVE A GRIP ON RECYCLING IN THE CITY.